A new rendering offers a first look at the exterior of the newest Disney ships that will arrive in 2021, 2022 and 2023. 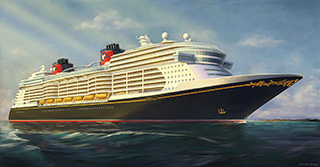 In keeping with the line’s style, the new ships “will embody the elegance and romance of the golden age of ocean cruising with unique touches all their own.” Disney Cruise promises more innovation, new technologies and more Disney stories and characters than ever before. Each new ship will be approximately 140,000 gross tons and is currently planned to include about 1,250 guest staterooms.